My mother found a recipe for a Strawberry Trifle in a Better Homes and Gardens Magazine in June, 1974…and was intrigued…. because, it actually reminded her of a dessert that she made that was called “Scheiterhaufen.” Scheiterhaufen is a German word for – a pile, or stack (of wood). My mother’s dessert was just that, only made with a Vanilla cake that is cut into 1 inch cubes, scattered into a large bowl with a Vanilla Custard Cream poured over it…..and the nicest part of it was that she added fresh, ripe, sweet cherries that were soaked in brandy, all over the cake, and finished it up with dabs of whipped cream. 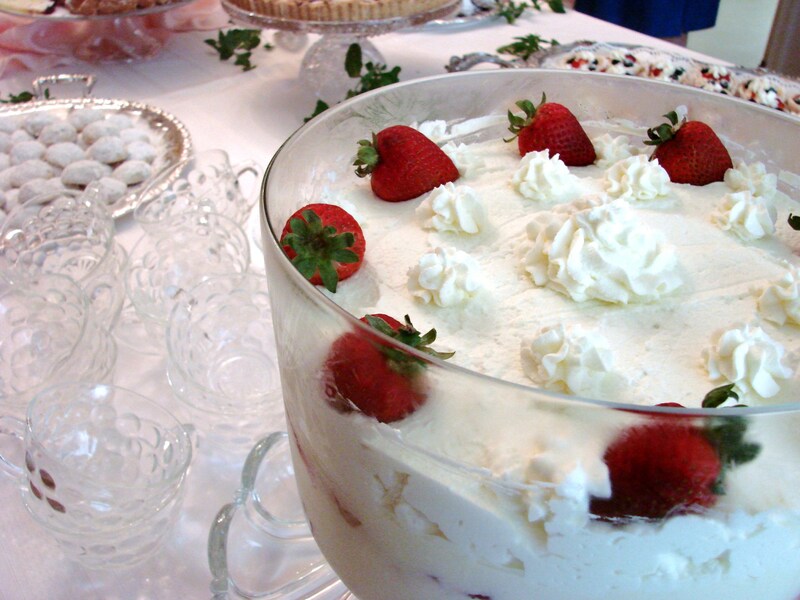 Therefore, when mother saw the recipe for a Trifle in the magazine she made the “Strawberry Crown Trifle” for our 1974 Thanksgiving Dinner, and it has been in our family ever since. It is a beautiful cake and impresses everyone when served. I have actually changed the original recipe……I made it a lager cake than the original recipe described in the magazine…. Since there are so many steps to making this cake, I am going to write the directions in a somewhat unusual way. I think it will be easier to follow. However, it is important that you read the whole recipe first to understand the steps and procedure before you start taking bowls and measuring cups out of the cupboard. This is a large cake for which you will need a larger than normal bowl. It will serve 12 to 16 guests. To make the cakes for the Trifle…..
Second Step..the sugar and eggs mixture: In a mixing bowl combine and whip….the sugar, eggs and vanilla, until they are very pale yellow. After having whipped together the eggs and sugar until they are very pale yellow, add the flower mixture…. alternating with the hot butter/milk mixture….mix gently with a whisk until all the flour is incorporated and it is very smooth….It needs to look like a pancake batter…. Now pour this batter mixture into the prepared 10 inch cake pans, and bake them at 350 F until the tops of the cakes are pale brown. In a saucepan combine the sugar, cornstarch, milk and eggs. Cook and stir over medium heat until the cream bubbles and thickens. Cool the cream in an ice bath to room temperature. Whip heavy cream and mix only about 1 cup into the custard. Reserve the other cup for decorating the top of the Trifle. Cut each cake in half to make 4 layers and place one layer into the bottom of a glass bowl. Spread 1 cup of the crushed berries over the layer and place the second cake layer on top of the berries. Sprinkle this layer with half of the orange liqueur, then spread the rest of the custard over it. Place the third cake layer on top of the custard and pour the rest of the orange liqueur over this cake layer, and then spread the rest of the berries over it. Place the fourth cake layer with the baked top…. on top of the berries. Cover the Trifle with plastic wrap and refrigerate overnight. 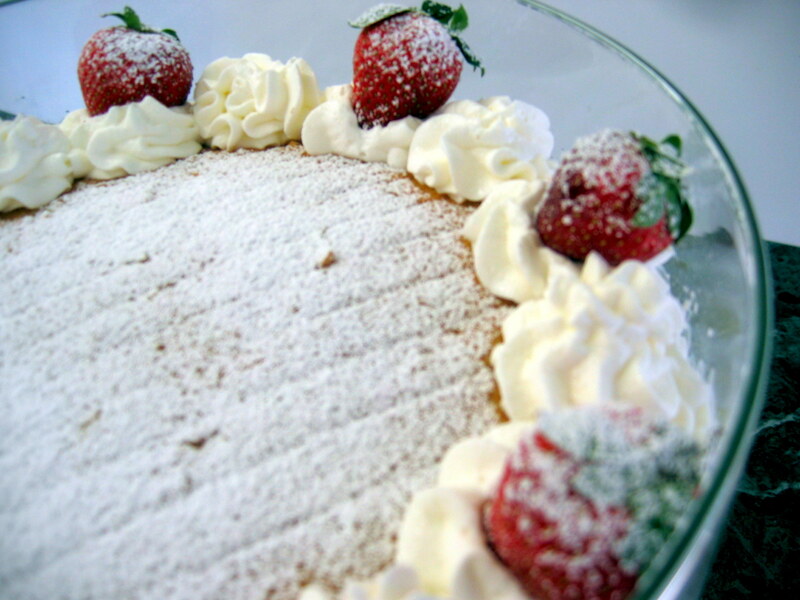 Just before serving, sift powdered sugar over the top and garnish with whipped cream rosettes and some big fresh strawberries. Return the trifle to the refrigerator until serving time. Please, share my blog ….. http://www.majaskitchen.com ….with your friends! You can subscribe to this blog ….find the subscribe button in the upper right hand corner. All you need to do is submit your email address. Thank you! Wishing everyone a most Happy Trifle Day! WiordPress is messing up my blog…..The information at the bottom is NOT the way I set it up….and I cannot find the EDIT button…therefore I am not able to try to correct it…. Thank you – Jack, for your nice comment….I so appreciate you visiting my blog….Yes, Maryland strawberries are the best and I use them when in season, but somehow a trifle comes to my table during Thanksgiving time or Christmas so the frozen berries are what I use….and I get just a small basket of very expensive strawberries during the holiday season for decorating the top of the Trifle…. Lots of love….and a big hug…. Maria, it sounds so scrumptious. I will try this the 4th of July week and blue berries and all berries. I will day dream about it until then. Thanks! Wow – the strawberry trifle has blown me away…It looks amazing. Mina….what a sweet comment….thank you so much for visiting my blog…I love it when people stop by and leave me a little note….hope you will come back again and visit my next blog story….it will appear soon. A big hug to you………. Tanja….so good to see you, thank you for stopping by….and at this time I would like to tell you how much I enjoy all your posts….in your beautiful blog.. I love strawberries as well….and eat them now that they are in season every day….and to think that I was allergic to them when I was a child in Croatia…. Sending you a very big hug……….! W H Stoneman…..thank you for stopping by, and thank you for your nice comment….Strawberry Trifle is one of my all time favorite desserts….hope you will be making it and enjoying it as well…. I made the trifle for Thanksgiving. It turned out great. Everybody loved it. I am going to try it next with tart cherries. I will let you know how it turns out. I also don’t like the taste of baking soda in the pudding. I will try it with potato starch. 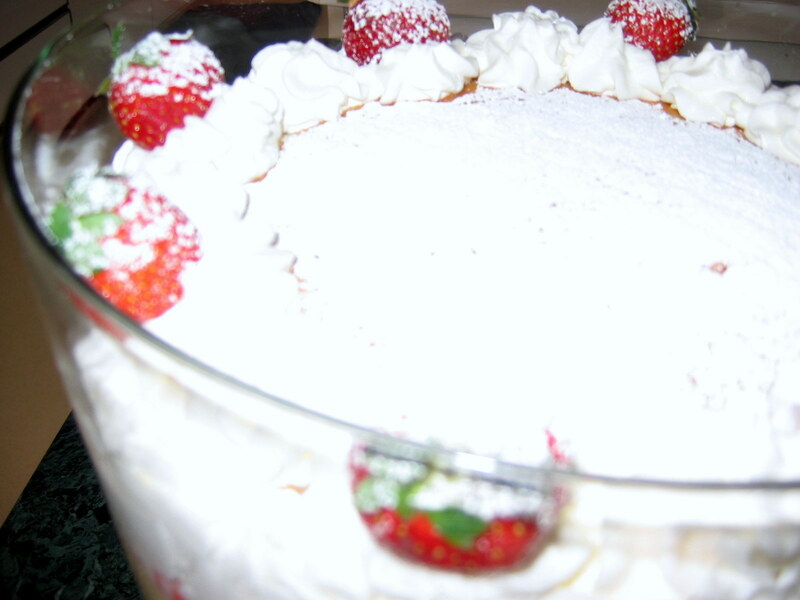 Hi Heidi….I rewrote the directions of the Trifle recipe….it will be easier to understand….There is NO baking powder in the custard…there is only milk, cornstarch, eggs and sugar…. Let me know if the recipe is easier to understand….I am very happy that you made it for Thanksgiving….actually I made it for Thanksgiving as well…and everyone loved it…they always do….